On Saturday, February 10, the International Service Summit will be held at the NIU Conference Center, 1120 E. Diehl Rd., Naperville, IL. 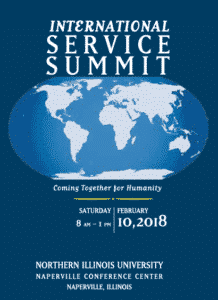 India Development Service is one of the organizations that will be offering information to summit attendees. Atia Abawi, foreign correspondent and author, will present her newest novel, A land of permanent goodbyes, which was published last month. The book is based on interviews with Syrian refugees. The author’s own parents left Afghanistan in 1981; she was born in Germany and came to the U.S. as a one-year-old. Atia Abawi was interviewed on NPR’s Morning Edition on February 2. Click here to read a transcript or listen to the interview.